While I love me a cup of yummy coffee from Starbucks, it’s not really practical or affordable to go to Starbucks every day. Having a coffee-maker is great but having something like the Tassimo Brewbot, which makes cappuccinos, lattes, espressos, flavored coffees, hot chocolates is just awesome. This little machine can apparently whip you up a latte like your best barista can. Using T-Discs the same way a Keurig uses a K-cup, you can select and make a wide variety of flavors. 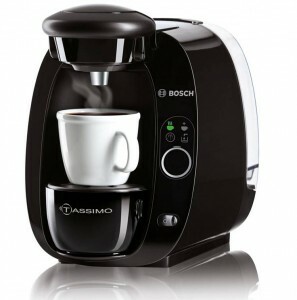 Giveaway: One lucky Mommies with Style reader will win a Tassimo T20 single cup coffee maker by Bosch. Enter to win by commenting below. What would you make first with your Tassimo? A Latte? Hot chocolate? Tea? 2) Tweet about this giveaway – be sure to follow and @mommieswstyle so I know you did it! I’d make myself a latte for sure! Promote the Open Forum to students. Tap the resource which is the leaders of Pupil Organizations. Do not make it so damn tough to complete every thing that wants performing on this campus by burying me in a mountain of paper. Great publish. I retweeted it for ya! It genuinely requirements more exposure!